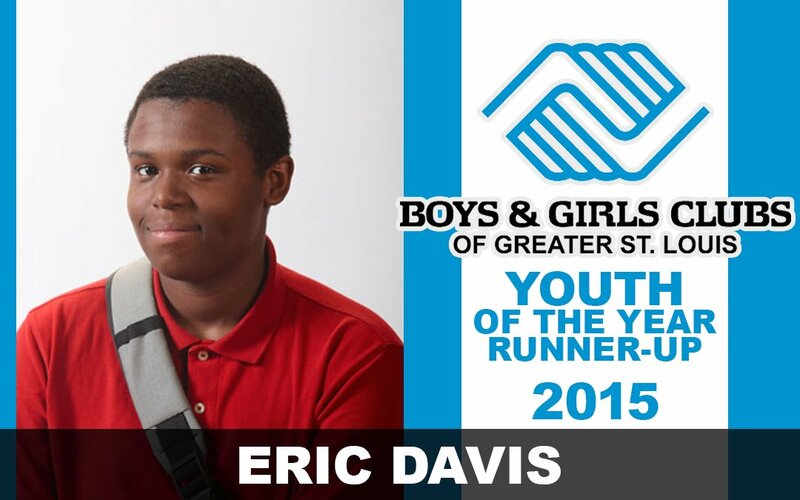 Eric Davis is our 2015 BGCSTL Youth of the Year runner-up from the Herbert Hoover Club. Eric is a senior at Cardinal Ritter College Preparatory High School. He is a cordial young man who displays outstanding citizenship. This past quarter he earned second honors for his academic performance. Eric is extremely active in the community, providing service as a tutor, mentor, and assistant staff to the young boys and girls at the Boys & Girls Clubs of Greater St. Louis – Herbert Hoover Club. Eric’s cousin and best friend was Michael Brown who was shot by a Ferguson Police officer in the summer of 2014. In his cousin’s honor, Eric is currently working with other Club leaders and the St. Louis City Police Department to develop workshops that create positive dialogue between youth and local law enforcement. Eric has been a member of the Club since he was 6. Eric Davis is a very special young man with vision focused on commitment and excellence. Youth of the Year encourages Club members to reach their full potential by achieving academic success, leading healthy lifestyles and contributing to their communities. Youth of the Year honorees are shining examples and living proof that great futures start at Boys & Girls Clubs. “The Youth of the Year award represents the culmination of the personal, academic, social and civic development realized by Eric Davis. We are so proud of all of our Youth of the Year participants who took the time to complete this challenging and worthwhile process. All possess the ability and ambition to be successful leaders,” said Dr. Flint Fowler, President, Boys & Girls Clubs of Greater St. Louis.